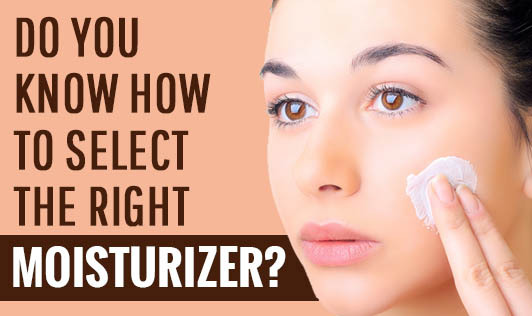 Do You Know How to Select the Right Moisturizer? As you walk into a supermarket, you would have noticed how people try to sell many beauty products all the time. It just leaves you confused about which one to buy. Here is something you should know about choosing the right moisturizer for your skin. 1. Note the first five ingredients: Try to talk to a doctor about the ingredients used. Look for common active ingredients, such as lanolin, glycerin, or petrolatum. Pick up a moisturizer that's made by a reputable company. 2. Go for a moisturizer with added sunscreen: Protecting your skin from harmful sun damage is one of the best things you can do to keep your skin looking young, so buy a moisturizer with a sun protection factor of at least 30. 3. Make it a skin-type appropriate choice: Buy a moisturizer that is thinner and more sensitive, so it's a good idea to use a different moisturizer on your face than you do on your body. 4. Consider using a moisturizer with retinol before bed: Retinol is vitamin A for your skin. It works by increasing the speed at which your skin cells turn over. 5. If your skin is very dry, consider to meet a dermatologist and use a moisturizer with a prescription. Tell your doctor if you experience burning, irritation, red skin, itching, or a rash so that he/she can prescribe the right one for you. Take care of your skin, apply face pack, moisturize it daily and keep it healthy. Above all this, a good, balanced diet with the right amount of exercise will do the trick!